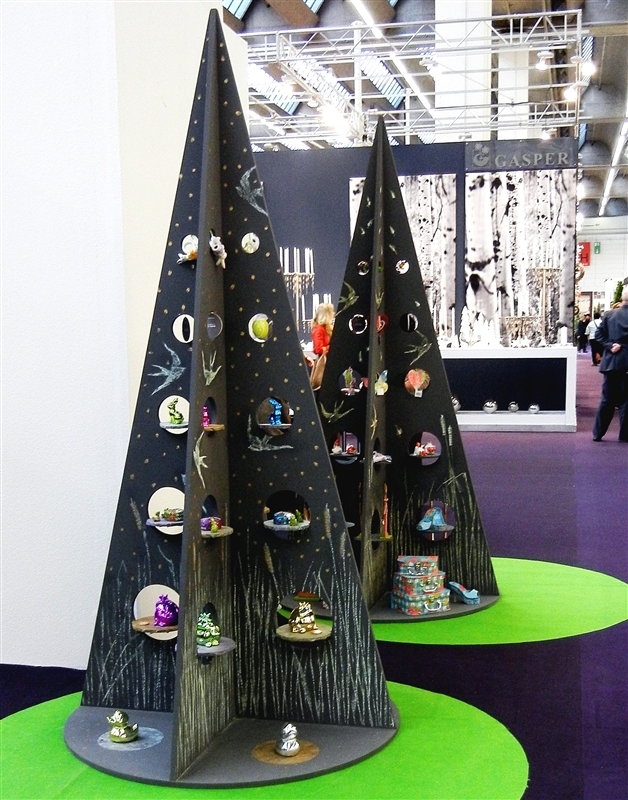 I am glad that so many of you enjoyed the photos from the Trend show at the ChristmasWorld trade show. If you missed that post you can find it HERE. There was a second creative display area within the ChristmasWorld show. The photos I have from inside the show are from this area or from stands that allowed a few photos to be taken. 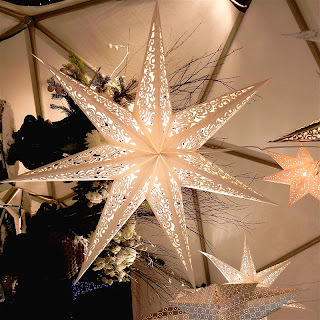 These paper stars with pierced designs are so pretty with all sorts of patterns pierced in the points. 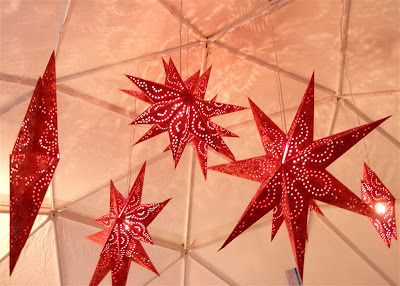 When we lived in Germany I learned to make similar stars with plain paper. I want to try to create some of my own designs for next year. It probably is more cost effective to purchase commercially made stars - it does take a lot of paper to create just one star. These Golden Piggies were at the entrance to one of the main halls. The sign in front of these figures explained an old tradition of fasting on Christmas Eve day. 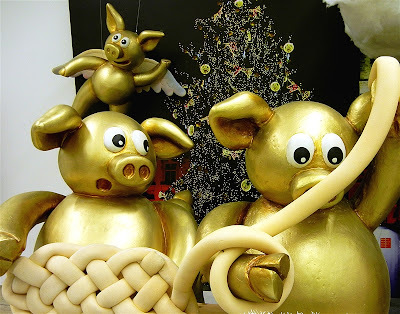 Children were told that they would be rewarded by the Golden Piggy if they didn't eat all day - waiting for the Christmas Eve feast. 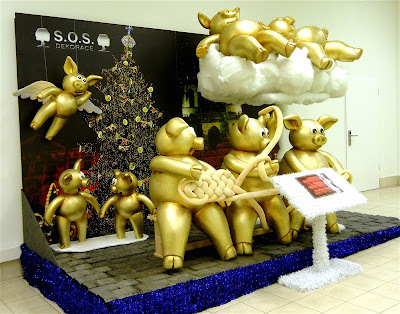 Pigs are also a symbol of good luck in Germany. When we lived in Germany, my husband was given little pig figures by his coworkers before he took the German driving test - we still have them! The special display area was in the back of this hall. 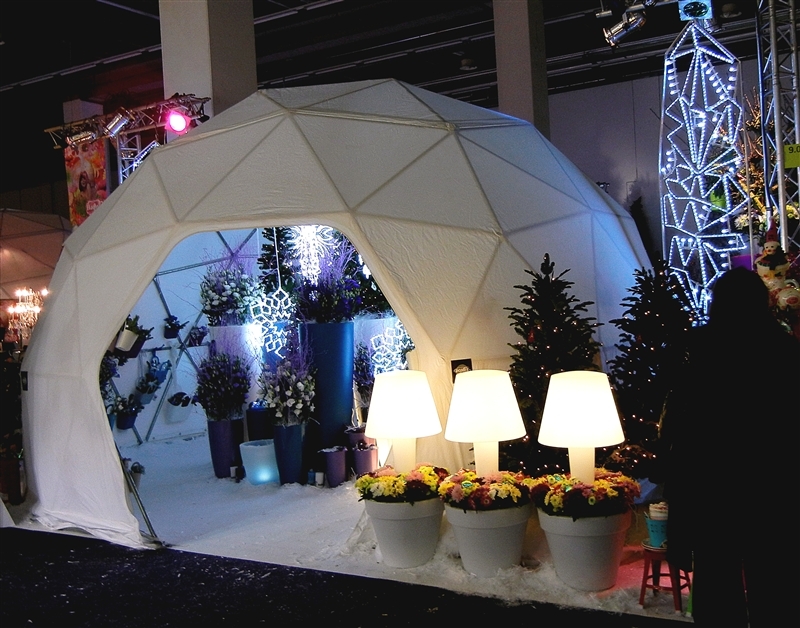 There were a series of these "igloo" domes set up with different decorating themes inside. One featured these chandeliers made of different types of lights. These watering cans were hanging from the ceiling of another dome. 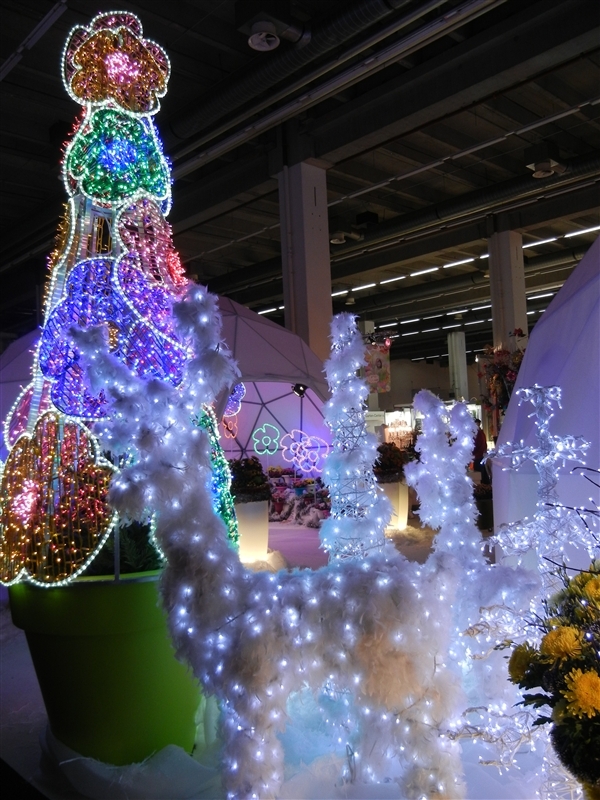 There were a lot of floral and garden stands in the ChristmasWorld show. I think some garden centers double up as Christmas shops to help with their slow season. 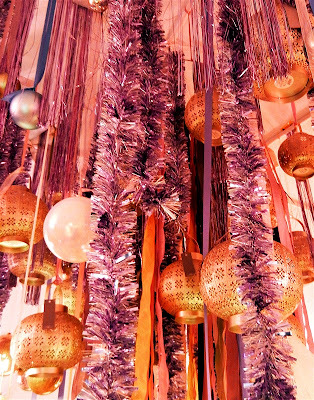 This dome was full of lavish decorations in peach and lavender. Several areas had lighted rings to create hanging mobiles of ornaments. I thought the pattern on these large globes was very pretty. There were plants and more electric flowers around the edges of the dome. 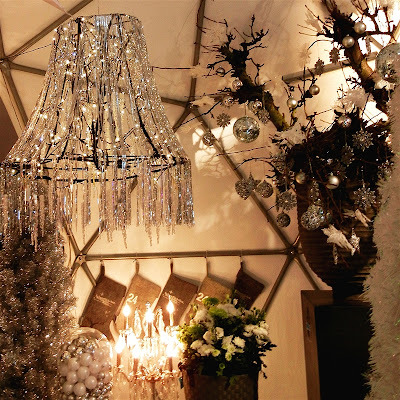 Don't throw away any old lampshades you might have - you can strip them and add tinsel and lights to make sparkling decorations like this. Outside the domes there were lots of trees - some made of flowers and some with bare branches. 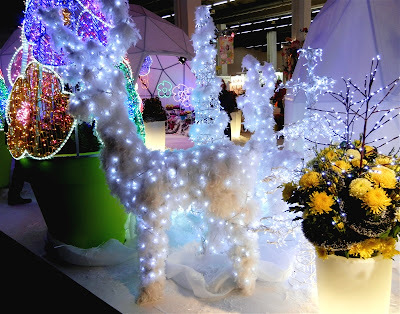 There were also fluffy reindeer with lights. 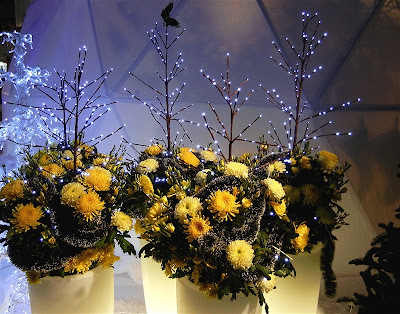 The trees coming out of the pots of chrysanthemums were pretty but seemed odd to me since we use the mums as fall decorations here in New England. 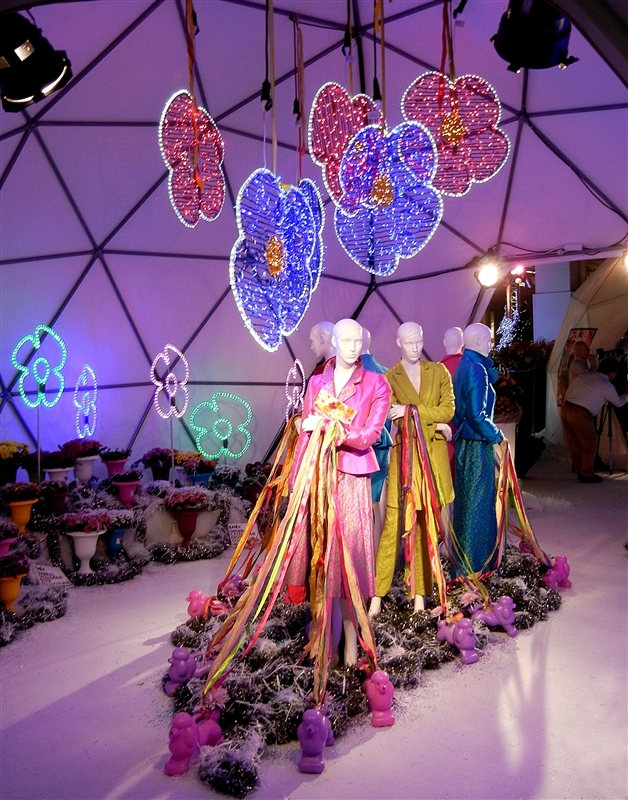 The trees made of flowers were scattered throughout the display area. This photo gives you a sense of the size of the hall - it was enormous and the ceilings were very high. 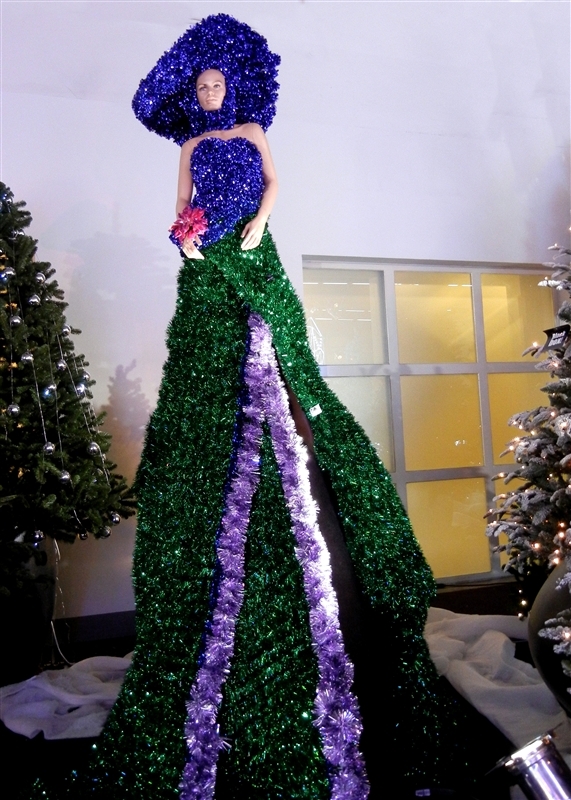 There were a lot of large Christmas trees along the back wall - along with this "tree lady." (Yes it looked very odd in person as well!). 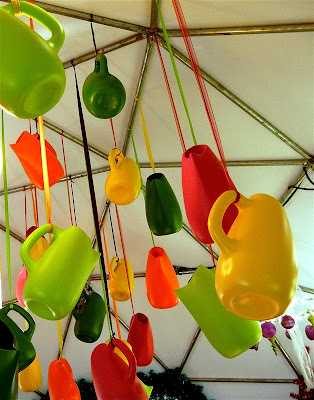 Many of the vendors did not want photos to be taken - they are trying to avoid copying of their merchandise. There were a few that allowed us to take photos. 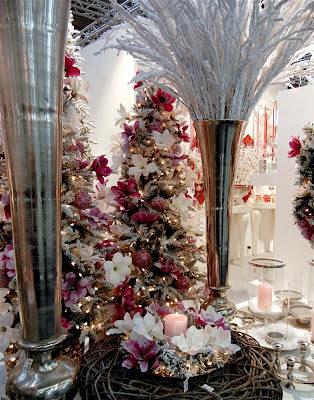 This white, gold and silver display was one of my favorites. 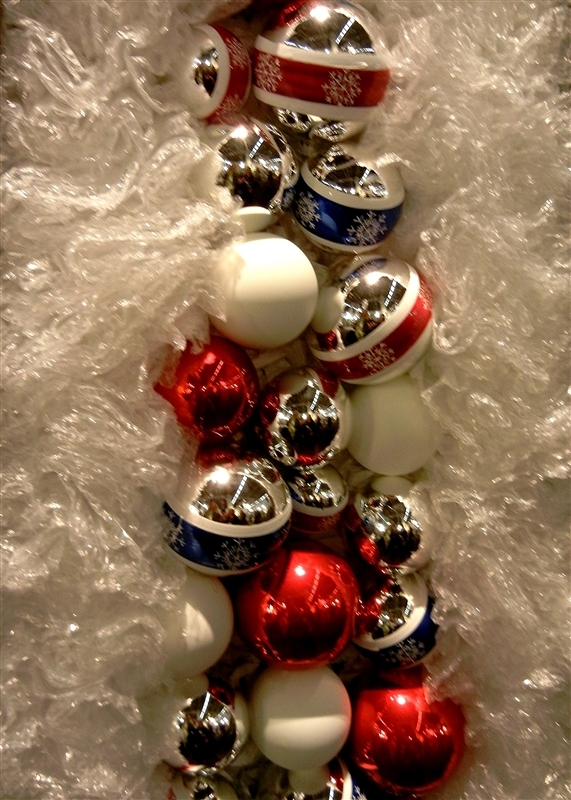 While the trees are quite lovely, many of them are decorated with items that have tags to help in the placing of orders. I tried to crop in on an area with no tags but there is one left in this photo. There were color themes and displays of the ornaments for that scheme. Purple seemed to be a popular color (remember there were some interesting purple ornaments in the trend show). 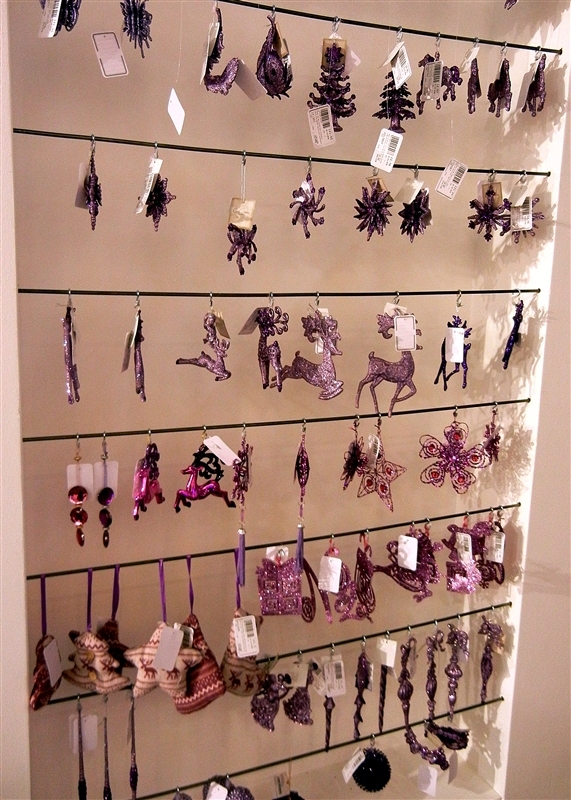 It was fun to see all of the variations of purple reindeer hanging along the rail. 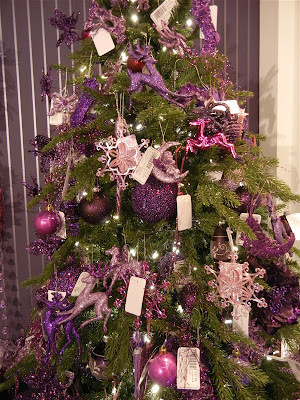 This was the tree in the purple area - the large tags are distracting but practical - after all, most of the viewers are there to buy for their shops and need to get through a lot of booths to make their choices. We saw lots of these fancy flowers that clip on to the trees. 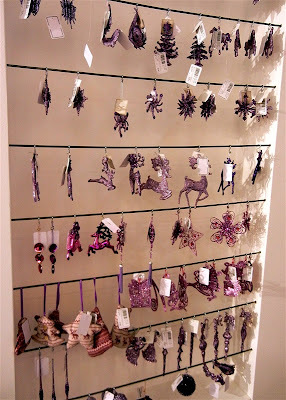 Clips make it easy to place the items just where you want them and they stay put instead of dangling. 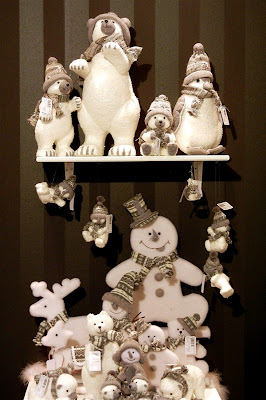 In addition to glass and other tree ornaments, there were lots of figures and decorations like these snowmen, polar bears and penguins. There were many stands with all sorts of outdoor lighting and trees. This large tree (about 10 feet tall) was one of my favorites. Mandy and I were looking for items that might work for papercrafters and we were excited to see these large flattened glass ornaments. We asked about them and found out that the photos inside are not changeable - there was a line of several sizes with about six different cute photos of children. 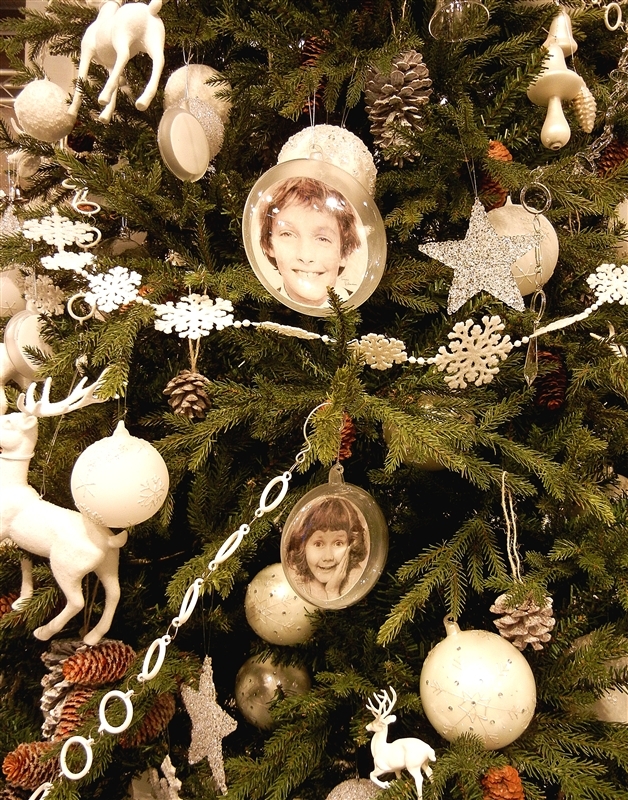 I am not sure why you would want to hang photos of children that were not in any way related to you on a tree...it would be much nicer if you could customize them with your own family photos! 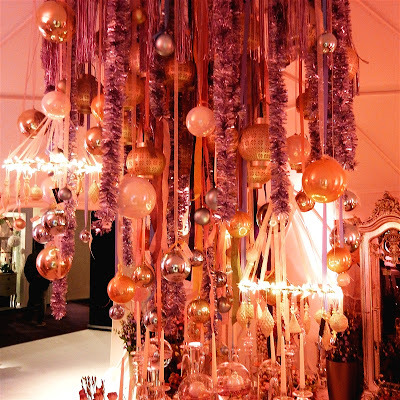 It was interesting to see that several booths had suspended the trees from bars in the ceiling and then displayed most of the ornaments by hanging them at the bottom of the tree. The amount of shine and color (more purple here...) was almost overwhelming - you needed to get away from it all after a while. 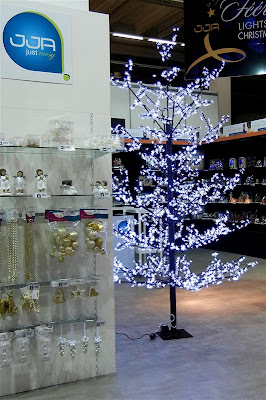 I wonder how long it takes to set up some of the displays - there are so many breakable items to deal with and they need to be arranged nicely to capture the attention of the buyers who are ordering for their shops. 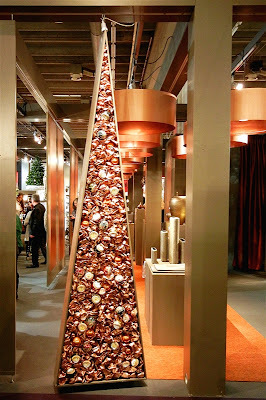 Some displays may have been done ahead of time and shipped assembled like this tree form stuffed with crumpled paper. 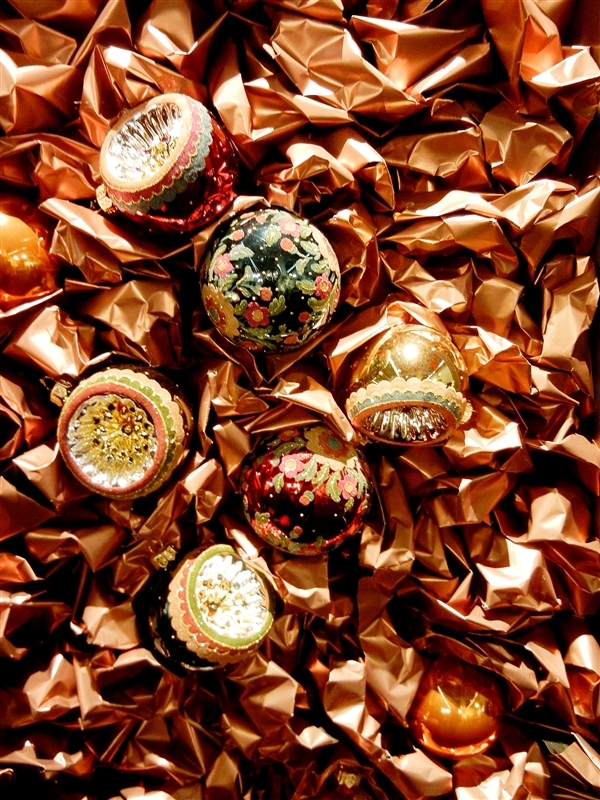 In this close view you can see the ornaments stuck in between the papers. The texture of the crumpled paper was very interesting. 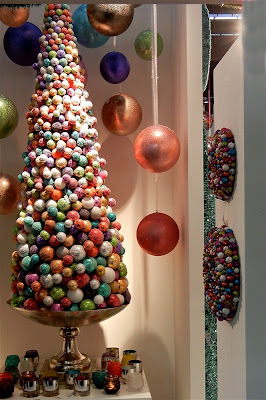 Another tree in the same area had a center made up of ornaments and bubble wrap cushions on both sides. I liked these display trees - another thing that you could try on a smaller scale at home. 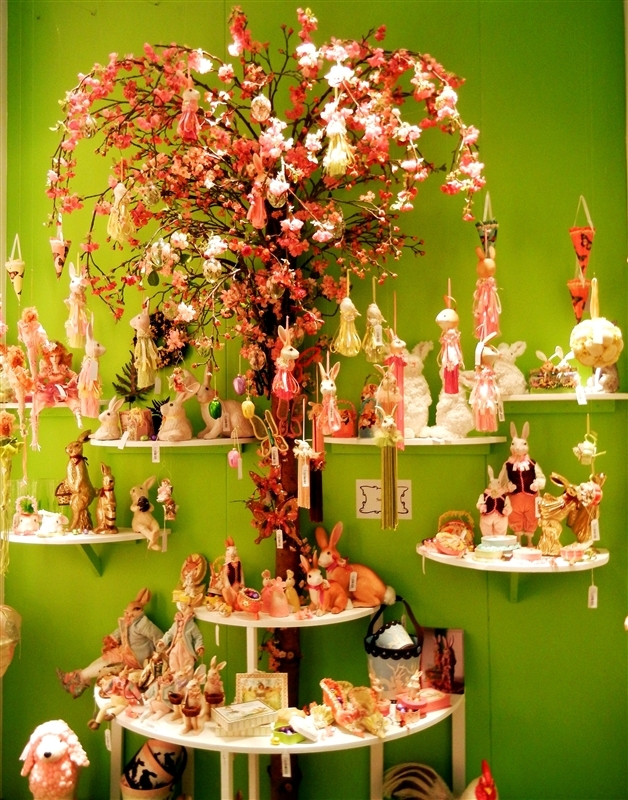 And last but not least - an Easter themed tree. 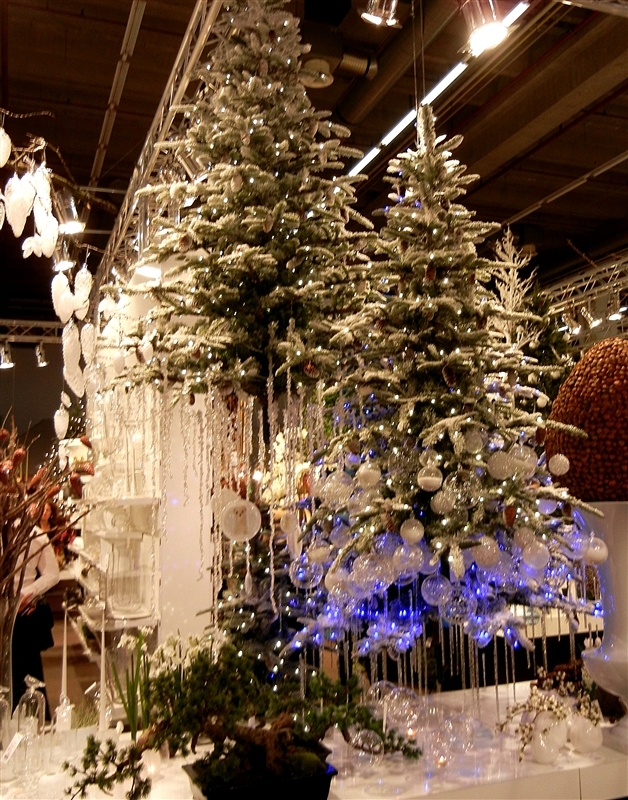 That's all I have to show you from ChristmasWorld. We didn't get around to all of the halls but it was a great way to fill the first day before the other two shows opened. The next post I do from the trip will show you some of CreativeWorld (I'll probably need to split that up into several posts). Wow! I would love to attend a show like this! I can understand how you could get overwhelmed after a while. I, too, really liked the outdoor tree. It was so bright! Thanks for sharing! It looks like an interesting show, I'm glad you were able to fit so much in to a relatively short trip, Diane. Such a feast for the eyes, but where are the snowflakes? I thought surely when I saw the first pic with the igloo there would be at least one predominately snowflake display. Thanks for sharing all these great photos, Diane. I'm overewhelmed just looking at them ;- ) I could see where it would be a bit much if you had to work in the booth day after day too! 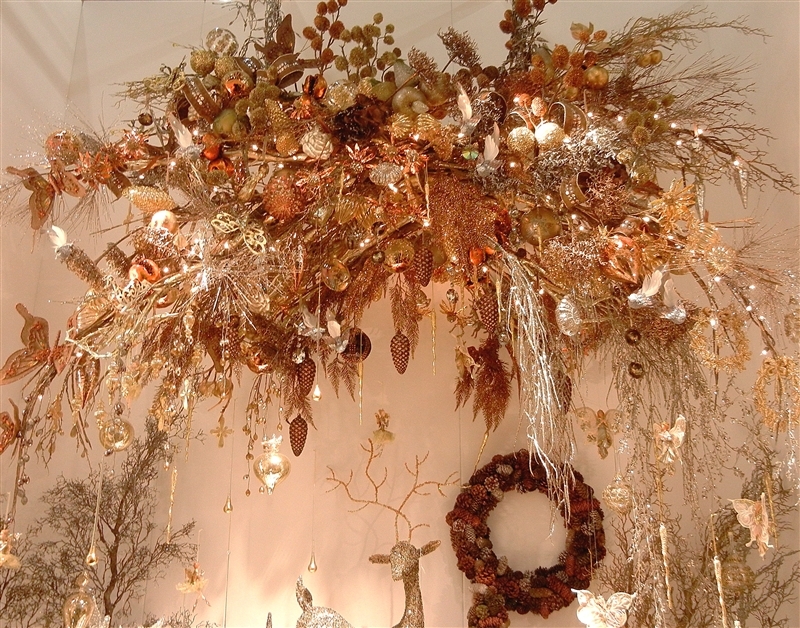 Beautiful displays. 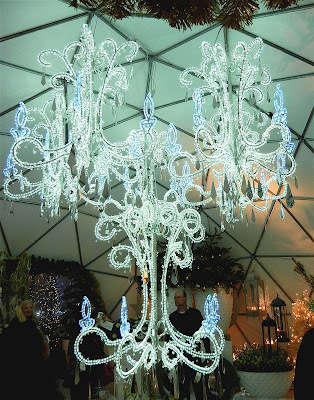 What type of lights did they use in the stars? 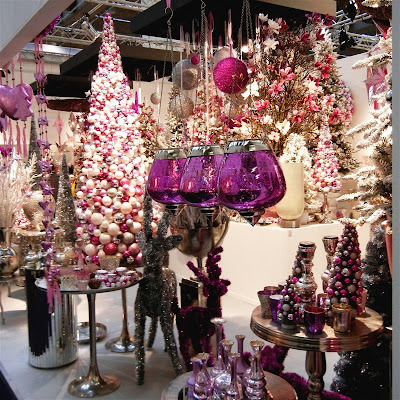 I love the pink & purple poodles and the chandeliers are amazing. 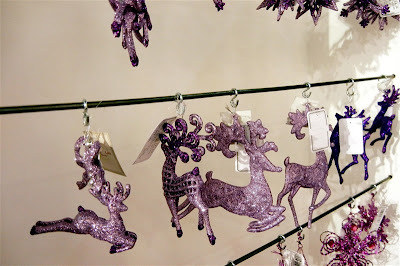 I was just checking out your photos and that looks like Christmas Heven. BEAUTIFUL! You could have never got me to leave that area. 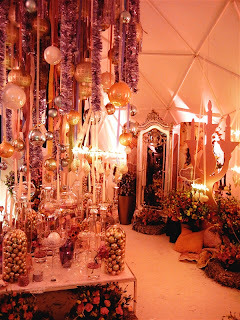 I just love loking at all of the prettys. Thank you for sharing them. WOW! 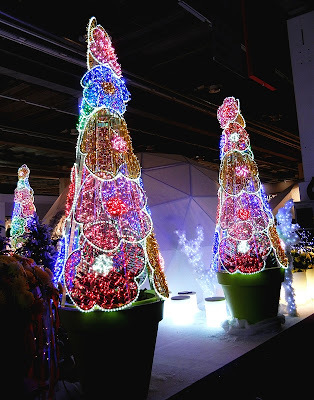 It really is amazing, lots of things to see, and a lots of lights! I agrre with you, the "Lady tree" looks odd and how sad that the picture ornaments have permanent pictures in them The spray would be wonderful for fall and the easter tree was neat too.. 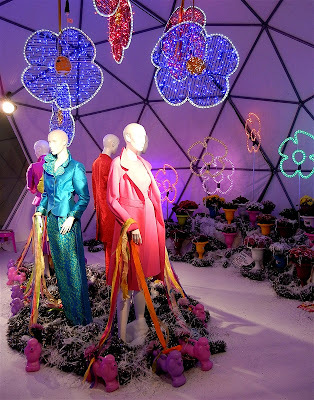 I loved the colorful poodles! TFS have a great day! 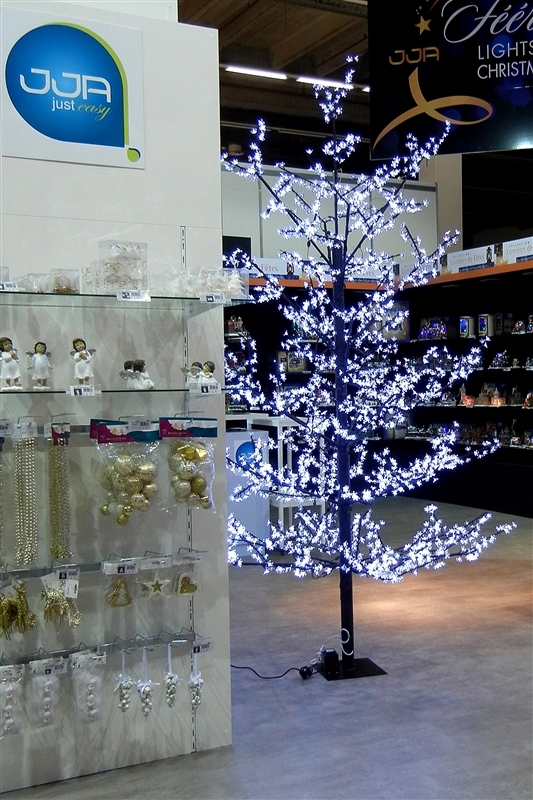 I love all the Christmas decorations. Hard to believe that a show with the newest takes place just after Christmas. love the lampshade idea, and the purples and peach colors mix..thanks for sharing all this with us! Thank you again for the lovely photos. It must be overwhelming to see all the different decorations. A lot of your pictures would make beautiful cards. Can't wait till you show your other pictures. Oh, my...sensory overload! Wonderful photos. Thanks! Thanks so much for these pics! I am a Christmas fanatic and I am just loving all that you have to share! I would have a tough time deciding which hall to spend my time! Awesome photos, thanks for sharing with us. 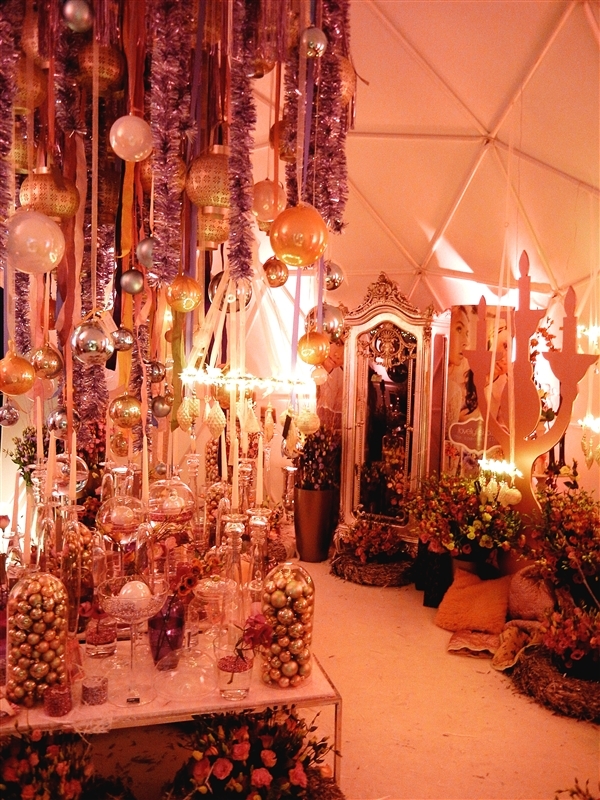 So much color and shine in one place, wow! 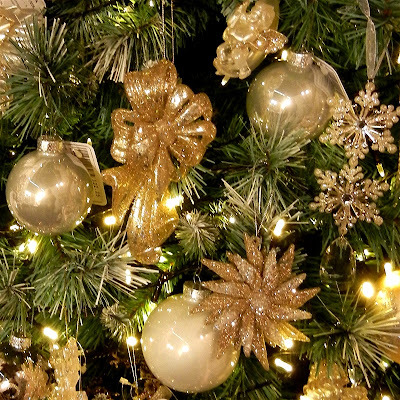 I have made ornaments, though not flattened ones, by printing pictures on transparencies, cutting them into the right size circle and inserting into clear glass balls. You can use digital images or photos. Amazing displays. 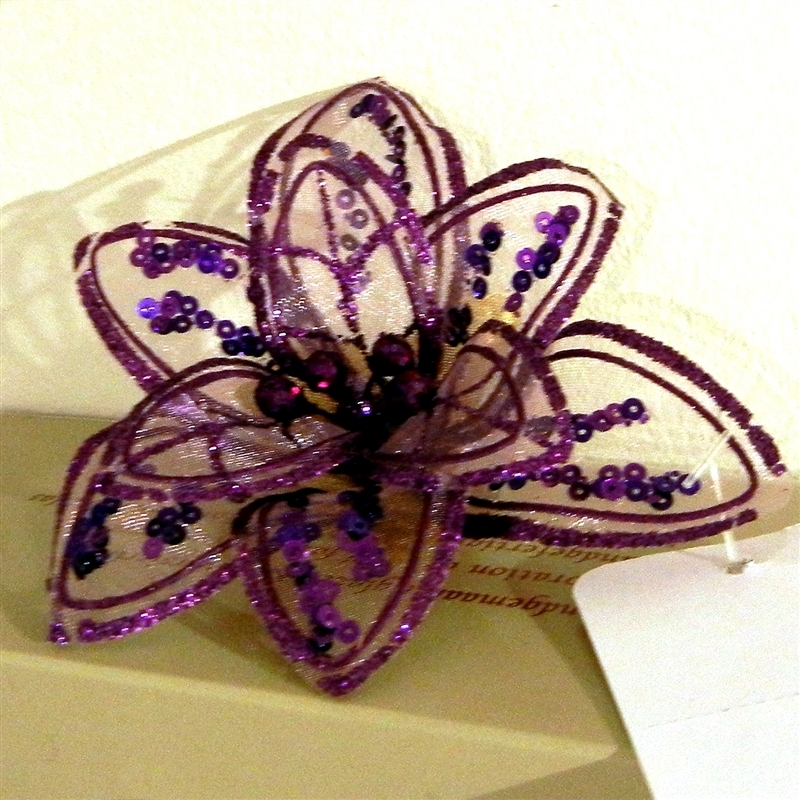 Love the purple. WOW! 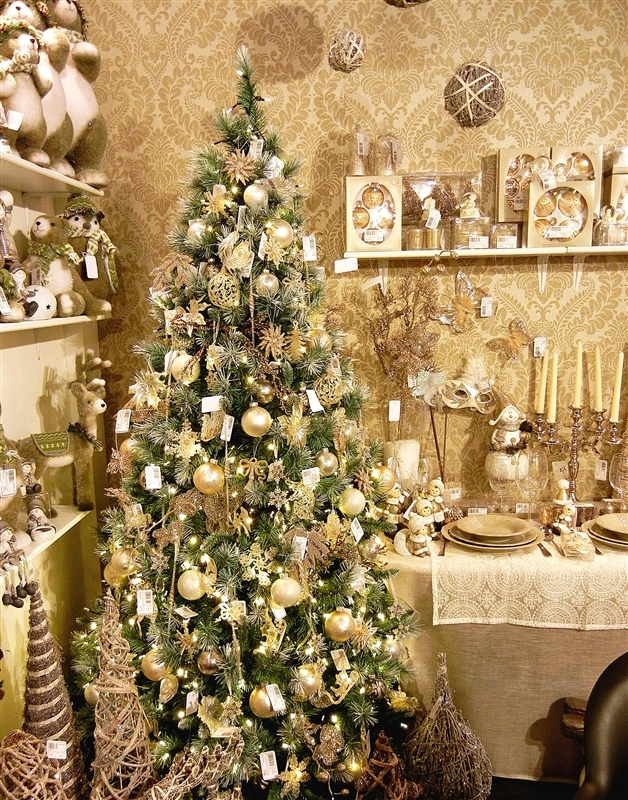 It's good to see that it isn't just the Americans that go overboard for Christmas! Enjoyed seeing the pics of the elaborate displays. I believe you when you said that you had to get away from them from time to time! I hope I am leaving my comments in the right place. Hi Diane,I think I've been with your emails since the beginning and have really enjoyed how your Blog has evolved. I have had a lot of pleasure and have learned so much. now have my Broadband sorted out so am up for anything and everything. Your pictures are soooo lovely!!! :) I almost feel as though I am there! Well this is exciting...... First of all I would like to again thank you for all of your hard work and wonderful ideas, and information. The pictures are amazing, wish I could have been there. Wow! this was incredible. Thanks so much for sharing this with us.